Some ride! I was prowling about at 3 this morning, and at 4.15 I was on the road. It was daylight, and from Hulton Lane Ends there was a clear view of Rivington. I was hoping that the day would be clear, for much of the success of today’s run depended on the visibility. I took the usual route through Atherton and Leigh, where there was a thick, chilly ground mist. Just beyond Lowton, I turned for Winwick, then down into Warrington at 5.30am. This was too early, for I had to meet Tom at Chester, 8am, so I eased off a little, walking most of the mild hills on the Chester road. Daresbury was left behind, and beyond Frodsham, I got a very spectacular view. Right away, across the sea of mist, the peaks of the Clwydian range, dominated by our objective, Moel Fammau, could be seen like so many islets on a vast white ocean. Near Mickle Trafford, I joined a pretty bylane to while away the time, eventually coming on to the main road again, two miles from Chester. Then I entered the narrow, half deserted streets, passed under Northgate, traversed the road by the quaint and famous Rows, and by the castle gateway (where was a guard) to the Dee Bridge, beside the racecourse for 7.30. Tom came ten minutes later, and at 7.45 we took the road on top of the walls past Agricola Tower (of Roman origin) and out of the city by the Wirral – Queensferry road. This level, straight stretch is rather weary, but we put up a hot pace which brought us to Queensferry’s Jubilee Bridge in under 30 minutes. Wales at 8.15! Taking the estuary road – memories of a ‘Midsummer Night’s Dream (see June 21/22nd) – we quickly reached Connah’s Quay, where we turned left, uphill to Northop. We halted for a moment to view Northop church, the yard of which we explored, then took the Mold road for two miles to Soughton, where breakfast was procured at 9am. To cut Mold out, we took a bylane, which brought us on the Mold – Denbigh road, then another narrow lane, and we joined the Cilcain road. Now we started climbing, until Waen was reached, where, opposite the church, a very doubtful looking track was taken. This led us through some really delightful woodland scenery past Cefn-mawr Hall, taking us to the summit of a flinty hill above Cat Hole. The well wooded Leete valley lay like a picture below us, with the black and white half timbered buildings set in a wonderful position, with the gleaming rock showing white through the trees. It was a grand view. A very steep descent, mostly unrideable, brought us on the main road through some ancient gateposts, and past the Flint – Denbigh boundary stone. The road took us quickly down to Loggerheads, where a heavy rainstorm drove us into shelter. When it came through the trees, we put our capes on, and carried on towards Ruthin for about a mile, leaving the main road in preference for the old, direct coach route, which we followed through the old Bwlch for one and a half miles, where we struck a track running up the hillside on our right. Our capes came off, for there was only a slight drizzle now, and the steep path was too awkward for the burden of capes. Climbing through the bracken, we were soon in a perspiring state, but the moorlands were magnificent. Upwards for over a mile, then the summit of Moel Fammau broke into view, with the squat, ruined tower on the top. A level mile, then we had a rare old struggle for the last quarter mile over slippery clay and turf. Another party were on the summit. We climbed over the huge masses of fallen masonry to the highest point of the tower, where, even on this misty day, a glorious panorama was set before us. The broad vale of Clwyd, like a patchwork pattern, and Ruthin, a collection of dots, and the winding river as it entered the sea at Rhyl, were plainly visible. For the rest, an extraordinary jumble of hills and mountains, moorlands and valleys, some wooded, some barren, villages and isolated farmsteads and brown roads. No doubt it was an extensive view, but what would it be if it were clear? Having negotiated the steep quarter mile to the join of the two paths (see sketch), we found it possible to ride – but only just! It was a nerve racking ordeal! The steep slope above, and almost precipitous drop below, and our path, a grassy, slippery, steeply descending way about one foot wide, gave us plenty of hard thinking – and hard braking too! At length – in record time – we regained the old Ruthin – Mold road, near Ruthin. 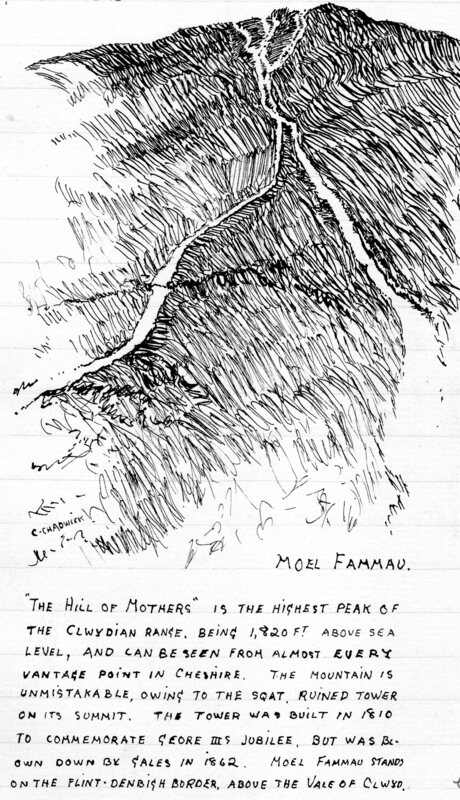 It was grass-grown, and hardly less steep – certainly stonier – than the Moel Fammau track. After rounding some hairpin, hair raising bends, we rushed down through a pretty wood, and joined the main road. We found our rims hot from braking! Thence Ruthin was soon reached but we had a long hunt for lunch. At last we found a decent place in Clwyd street, where the people were English, the husband a Lancastrian like ourselves. At 2pm we left Ruthin, inside capes, for it was again raining hard. We intended getting to Llanbedr-Dyffryn-Clwyd, but got on the wrong road and came to Llanfair-Dyffryn-Clwyd. A bylane put us right – or so we thought – for Llanarmon, via the mountain road. We got lost, and wandered through farmyards and on to sheep tracks, over streams, through gates, across barbed wire entanglements, forcing our way onto the open moorlands. It yet rained hard, but our capes came off – they were too cumbersome. It was a ‘tough un’. At last we left all vestige of road, and struck directly across the hills, over Moel-y-Plas, 1,443 ft. I don’t know how many walls, barbed wire, railings, etc, we lifted the bikes over, or how many bogs we walked into, but we began to get desperate.